Lung Foundation Australia’s CEO Heather Allan joins host Tabetha Moreto in conversation where she talks about the marvelous work that she and her organization does to help Australian suffering from lung disease. Heather highlights the prevalence of lung disease in Australia and she clarifies some misconceptions related to this. Heather Allan is the Chief Executive Officer for Lung Foundation Australia and brings a wealth of business, public health promotion and advocacy knowledge to the role. She has worked for the Lung Foundation since 2005, initially as Director of the COPD National Program before becoming the Director of Marketing and Health Strategy. Heather has a strong background in public health awareness campaigns and in developing strategies to encourage people to look after their health. Before joining the Lung Foundation, Heather worked in various senior roles in public health in New Zealand. In addition to public health roles, she served for four years as the Executive Director of the Canadian Chamber of Commerce in Hong Kong. Tabetha Moreto: Hello everyone. This is Health Professional Radio. I’m your host for the day, Tabetha Moreto. Our guest today is Heather Allan the CEO of the Lung Foundation Australia. Today, she’s going to talk about her organization and the amazing work that she does. Without further ado, welcome to the show, Heather. It’s so nice to have you here. Heather Allan: It’s nice to be here. Thank you for having me. T: My pleasure. So Heather, please tell the audience something about yourself and specifically about the nature of your work. H: Well, I’m a Canadian living in Australia and I’ve been very privileged to work for Lung Foundation Australia for around 13 years. The Lung Foundation Australia is the only national charity that supports anyone with a lung disease. Our mission specifically is to improve the lung health of Australians and to reduce the impact of lung disease and we do this by raising community awareness about the importance of lung health and symptoms of lung disease. We fund world-class research. We drive early detection and best practice management through the development of guidelines and the dissemination of these guidelines. We empower patients to take an active role in the management of their lung disease and we advocate for those living with lung disease so that they receive appropriate and equitable treatment no matter where they live and no matter what disease they have. T: That’s wonderful to hear. So can you tell us how prevalent is lung disease in Australia? H: Well, the Australia of Institute of Health and Welfare tells us that about one in four Australians is living with a lung disease. Now, there are about 30 different lung diseases in Australia that range from asthma to chronic obstructive pulmonary disease right through to lung cancer and rare lung diseases like idiopathic pulmonary fibrosis. We know that about one in seven deaths is as a result of lung disease. In fact, it’s the second leading cause of death in the country when you add up COPD and lung cancer. In particular, lung cancer is Australia’s biggest cancer killer. It kills more people every year than breast cancer, prostate cancer and ovarian cancers combined. And COPD is our second leading cause of avoidable hospital admissions. But despite this and the significant impact that lung disease has in Australia, we know that the community doesn’t talk about lung disease particularly often and they’re not overly aware of symptoms of lung disease. So our job is to raise awareness that anyone can get lung disease, what symptoms of lung disease are and that anyone with lung disease deserves our support and empathy. T: I see. That’s good to know that you have an organization out there who wants to raise awareness for lung disease and I’m very surprised myself that it’s very prevalent in Australia. H: Yes, it is. As I said one in four Australians will be living with some form of lung disease today. T: Yes. Now let’s talk about misconceptions. Are there any misconceptions regarding lung disease that drives you crazy and it keeps you up at night? H: There are in fact. I suppose the two biggest misconceptions are that who can get lung disease. When the Lung Foundation conducted a survey recently and found that over 90% of Australians believe that smoking is the only risk factor for lung disease and while smoking of course is a significant risk factor for all lung disease, it’s not the only one. Smoking is in fact a risk factor for a number of other conditions including heart disease, vascular disease and even breast cancer. Smoking is a risk factor there. But despite that, Australians believe that one in three Australians believe that those with lung cancer have only got themselves to blame. Now, we know that again smoking is a major risk factor for lung cancer but it’s not the only one. And one in three women diagnosed with lung cancer this year is a lifelong never smoker and one in 10 men had been diagnosed with lung cancer is a lifelong never smoker. There are many risk factors for lung disease including genetics, pollution and occupational exposure. T: Thank you so much for clearing up those misconceptions and I have to admit, I’m one of those people who believe before in the past that lung disease is caused by smoking but thanks to you I’m learning more about lung disease. H: And what we need to remember is that whether your lung disease is as a result of smoking or not, no one deserves lung disease and everyone with lung disease deserves our empathy and support. T: Absolutely I agree with you on that. Now, Heather, if you don’t mind can I ask you a personal question? T: Why are you so passionate about helping those with lung disease? H: Well, I think lung disease is a forgotten disease. Everywhere I go people will talk about a range of conditions but very rarely do I hear people talk about lung disease. And I believe that this is because there’s a stigma associated with lung disease. Just as our survey revealed, we know that people associate lung disease with smoking and that translates into their feeling that people with lung disease somehow brought it on themselves and are therefore somehow less worthy of our support and empathy and this gets me riled up. Anyone with lung disease deserves our sympathy and support and we should be talking more about lung disease but this stigma will drive a lack of philanthropic support, a lack of corporate support for lung disease and a lack of support for research funding. So I see my job as raising awareness that anyone can get lung disease and that anyone with lung disease deserves our empathy and support. T: That was a beautiful message. Thank you so much for that and like I said earlier, I agree that people with lung disease deserve support and empathy. I would love to chat with you more, Heather but we’re running out of time. But, before we go for those who wish to contact the Lung Foundation Australia, how can they do that? H: There are two ways that you can contact us. 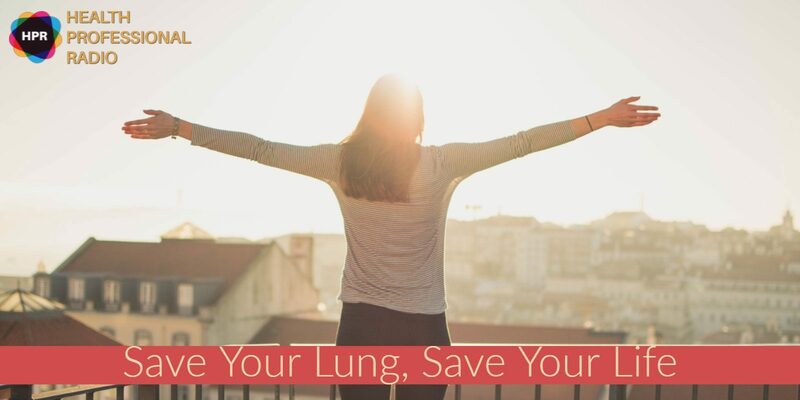 You can jump on our website at www.lungfoundation.com.au or you can call our national helpline which is 1800 654 301. T: Fantastic. Thank you so much, Heather for coming on the show. It was wonderful having you. H: Thank you for having me. T: And that was Heather Allan CEO of the Lung Foundation Australia. If you like this interview, transcripts and archives are available at www.hpr.fm. We’re on all social media platforms. So don’t forget to follow like and subscribe. Show us some love by subscribing to our HPR YouTube channel. We’re also available for download on SoundCloud and iTunes. I’m Tabetha Moreto and you’re listening to Health Professional Radio.